Renowned Dutch artist Marjolein Bastin has been delighting us for years with her gentle, intimate glimpses into the natural world. Trend Setters Ltd is pleased to offer hanging glass ideal for winter display. The translucent yet vibrant color is showcased in the 3.5” squares suspended at a diamond angle. 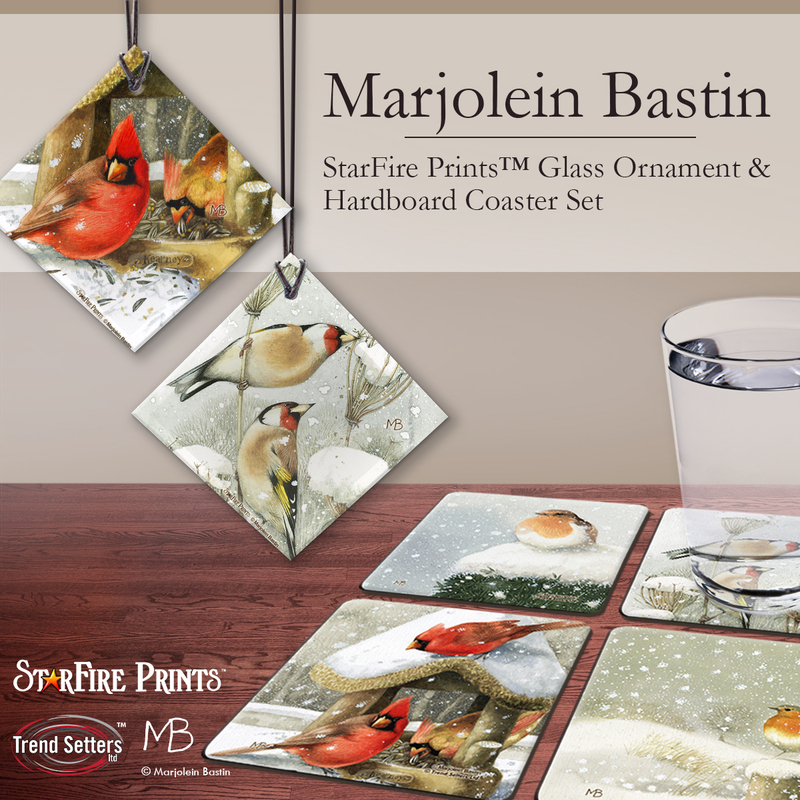 StarFire Prints™ hanging glass are photographic quality prints on translucent glass. Featuring artwork from your favorite artists, these prints are an elegant way to display your fandom to the world. These images are permanently fused into the glass, resulting in a semi-translucent print that captures the natural light, enhancing the color display and making each image a true piece of art. The glass is scratch and fade resistant and arrives to you ready for display. Proudly made in the USA. Beautiful cardinals around a unique bird feeder. I love your work would be proud to have one of your flags in my front yard. Our dear son left us in 2000. The red cardinal was singing in the tree outside the church after his funeral service and he has been with us ever since. Love Cardinals! They always give me comfort when I see them in my yard. ♥ Thank you for this opportunity! Much love and blessings to all. This flag is so cute! I would love to win this flag because I do love cardinals. I love your art work! My grandpa & family was from s’Hertogenbosch, NL I love anything from Holland ! I’ve always loved your talent. I get to enjoy the beauty of nature without going outside. Thanks you the opportunity. You have such talent…i have always wished I could paint like you. And I love all your colors…so natural and beautiful. Thank you for all the lovely work you share with us all. Have loved your art work for years!! !